KTMtwins.com KTM Motorcycle and Product News: KTM 690 Supermoto Full System by Akrapovic on sale now! 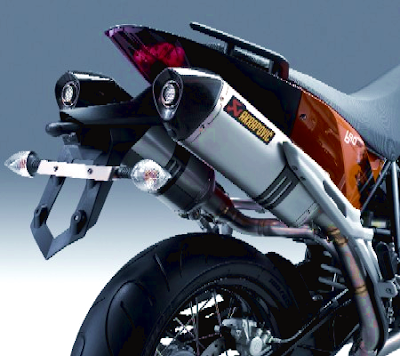 KTM 690 Supermoto Full System by Akrapovic on sale now! You've been looking at it but can't justify the expense. How about reducing the price by $450.00 and throwing in free shipping. We've only got two of these full systems in stock so you better jump on the bandwagon. Select the Full Titanium Headers and the Evolution Ti Silencers and get ready to rumble. First two customers to order this up will receive the discounted price.